The terminology referencing personal protective equipment (PPE) was changed in 2012 by NFPA. What had previously been referred to as FR (flame resistant) clothing is now called Arc Rated or AR. The reason for the change is that all clothing with an arc rating (AR) is flame resistant (FR) but not all FR clothing has an Arc Rating. FR doesn’t have any standards applying to any particular hazard. FR was traditionally believed to be generically protective from flame at some level but this is not the case for some fabrics. AR indicates that a garment has an arc rating and the level of protection has been determined through testing. Fabrics for personal protective garments are put through a Vertical Flame Test to measure and observe the response of materials to heat and flame under controlled conditions. Ignition – FR PPE is worn to protect against ignition in an arc flash hazard situation. When an arc flash ignites non-flame resistant clothing, the wearer can be badly injured from the burning garment. A garment can continue to burn, increasing the extent of the injury to the wearer, and can even cause internal injuries including airway and lung damage in some cases. Wearing FR clothing helps to reduce burn injury and contains burns to the body surface directly related to the area of origin. Insulation – Flame resistant clothing gives the wearer insulation from the higher degrees of burn (2nd and 3rd degree) through the garments and can lessen the impact on the area directly affected by the incident. Arc rating and flame resistant are two different things but are often confused because they go hand in hand. You can’t have an arc rating without the material being flame resistant. It is crucial that you read the labels of garments and equipment before buying and to specify a standard to meet. If an arc flash hazard is apparent, the AR label should be present on any PPE. Choosing a garment labelled FR will not be sufficient protection in an arc flash situation. For further information please feel free to email us or give us a call on 057 866 2162, we’d be delighted to discuss it with you. 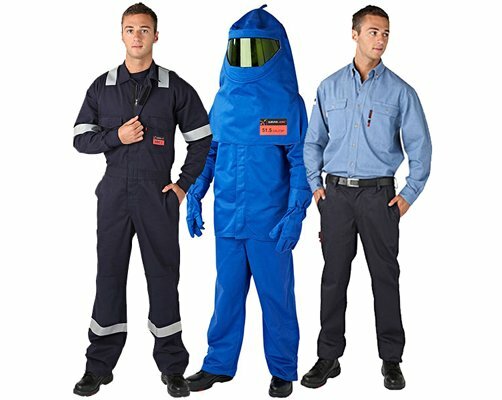 You can also browse through our range of Arc Flash Protective Clothing and Equipment.